Boss Media casinos offer multi-player Pai Gow Poker with player banking. At Boss Media casinos the player gets chance to be the banker, which gives them the best odds online. As the banker, you have the advantage of winning any copy hands, just like the dealer. The turn to be banker alternates between the players and the dealer, the dealer banking every other hand. If a player declines to bank or there is nobody in a seat the banker will revert to the dealer. There are five player positions at the table. So the player will have a chance to bank once every 10 hands. As banker in a one on one game the house edge is 0.08%. The more other players there are the less the house edge as banker. In a one on one game the average house edge is 2.57%. Your winnings will be charged a 5% commission by the house. 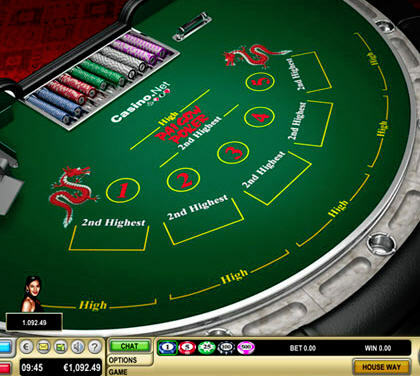 You can select a table with your preferred bet limits: €5-100, €25-500, or €50-1,000. The wild card, or joker, may be used only as a single ace or to complete a flush, straight, or a straight flush. There is no side bet on this game. Opt for "house way" and your cards will automatically be set for you by the dealer using the same rules employed by the casino. Multi-player gaming means up to 5 players can join the same game and chat with one another. You have the option to open a reserved table, and select the players you’d like to join. A different screen perspective is shown from every seat at the table. You can observe a game without joining. Play for free in Practice mode with no real money involved. 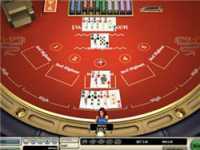 Comments & Feedback on "Boss Media Pai Gow Poker Review"